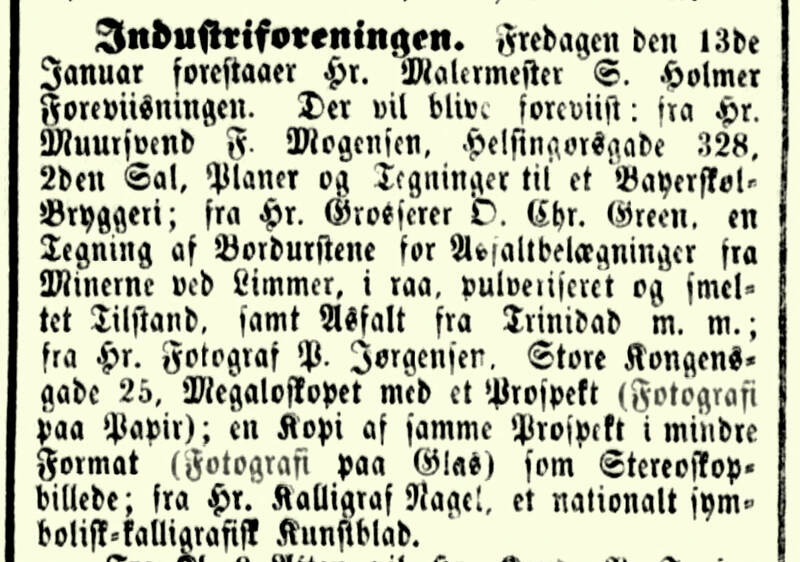 P. Jørgensen, som var fotograf i København og rejsefotograf i sommermånederne fra 1856 (ifølge annoncer), fremviste i 1860 i Industriforeningen i København et megaloskop med et Prospekt (Fotografi paa Papir). Se mere længere nede på siden. Being an optician, he set about building a machine to help others appreciate the illusion of depth that he loved; the alethoscope, soon improved as the megalethoscope, patented by Ponti in 1861. 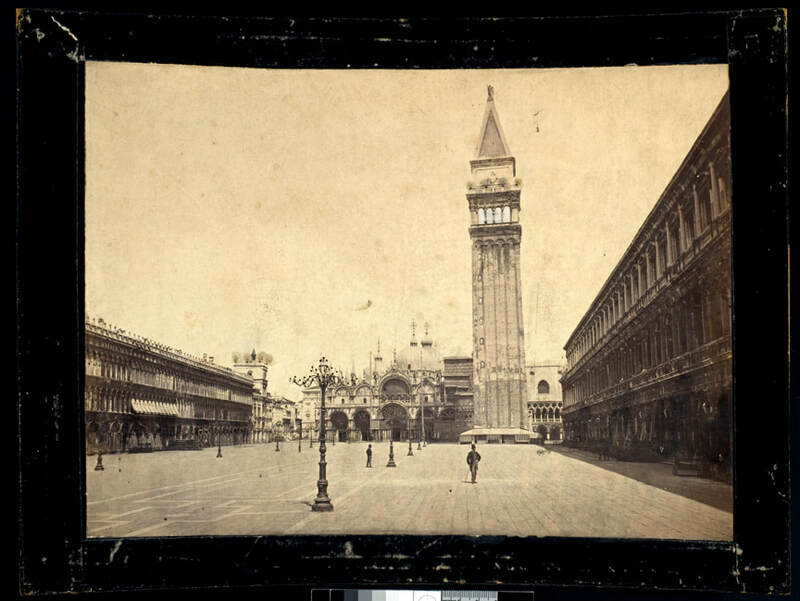 A massive device, some versions being five feet in length, it was a large and elaborate piece of “optical furniture” for the parlors of the bourgeoisie and produced in various finishes from relatively plain to extremely ornate. It was clearly meant as a status symbol, anticipating the varieties of radio and television cabinet. It had the simple purpose of bringing perspective to life, of restoring the depth effect embedded in the photographic image. 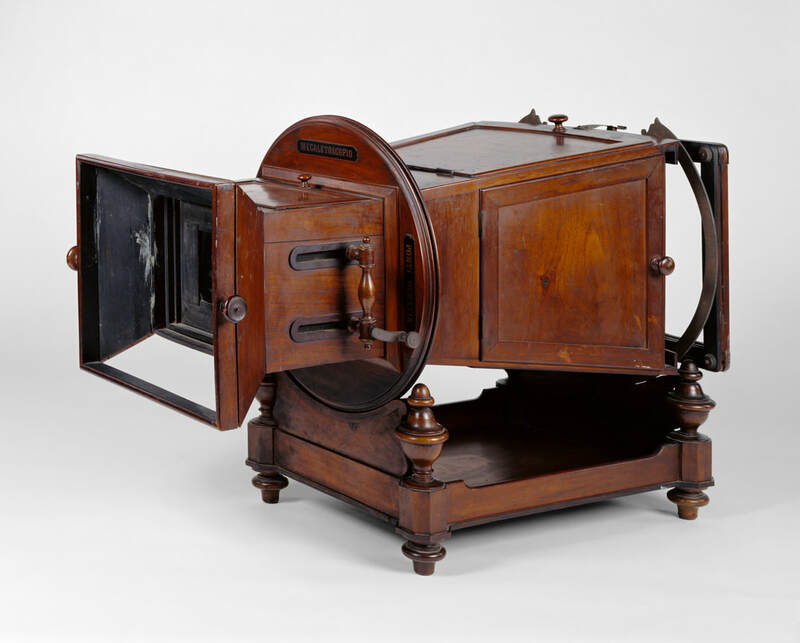 The Brewster stereoscope, much admired by Queen Victoria, had already appeared at Britain’s Great Exhibition of 1851, but what was useful about his invention was that it simulated the same effect in the single image. Til venstre: Megalethoscope og et kabinet med billeder. Af Carlo Ponti. 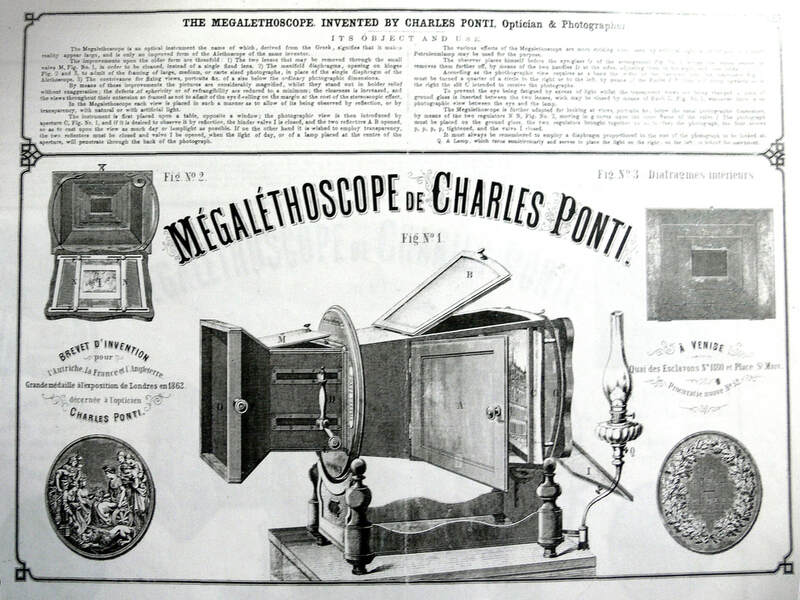 Le megalethoscope est un appareil optique conçu par le photographe vénitien Carlo Ponti 1862. Kilder: Megaloskopet på fransk HER.og engelsk HER. Billederne herunder er ét og samme billede, øverst almindeligt gengivet med lys kun forfra, derunder lys forfra og gennemlyst og nederst kun gennemlyst. A large lens was housed in the narrower, viewing end of the device, its focus adjusted with handles at the sides. It enlarged the image but also restricted the view so that the spherical perspective effect was best visible. 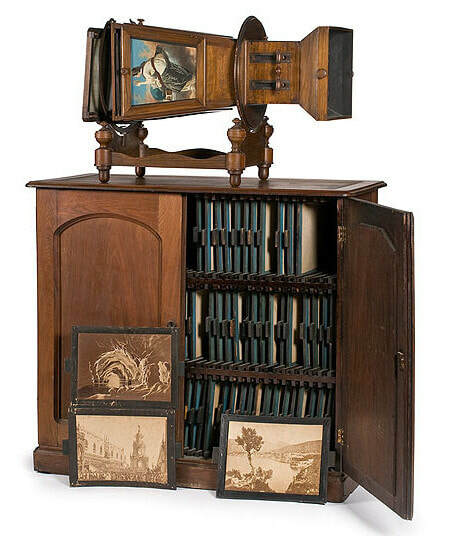 A large albumen print was inserted into an adjustable holder in the wider end that could be rotated for ‘landscape’ or ‘portrait’ format images. Doors with mirrors fixed on their inside could be swung open to maximise illumination of the picture from light available in a day-lit interior or from the fitted kerosine lamp. 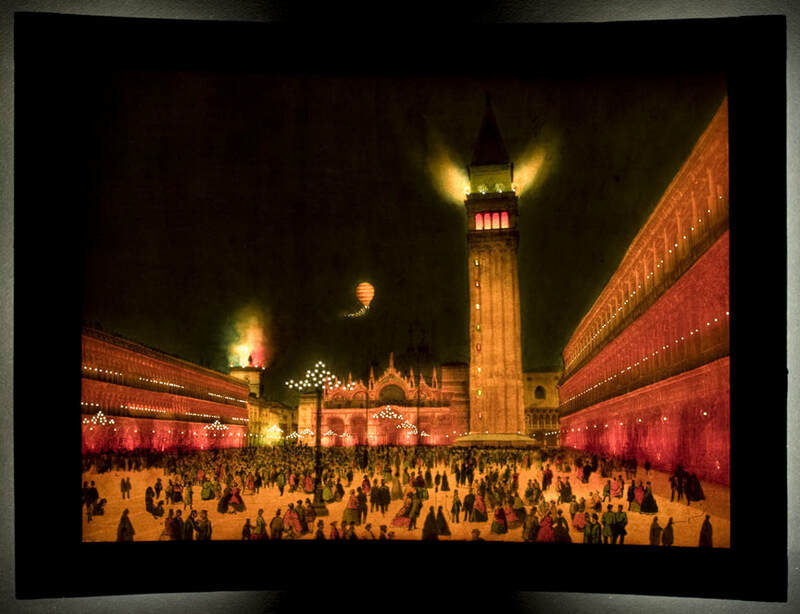 Alternatively, the print could be illuminated from behind by closing the doors using the lamp or a nearby window. 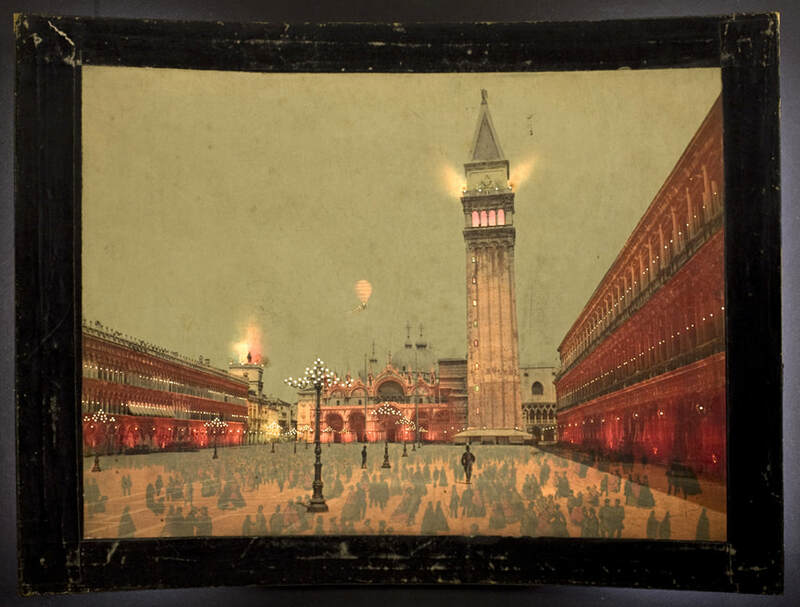 Right is an example of Carlo Ponti’s own coloured albumen print slides for the megaloscope which were sold, with the device itself, in his own outlet in one of the arcades to the right of the Square of St. Marco in Venice in the mid-1800s. Fyns Stiftstidende 25. august 1860 megaloskop kunne også erhverves i Odense - direkte fra Paris ... .